Heat oven to 325°F. Spray 9-loaf-cup baking pan with cooking spray; sprinkle lightly with flour. In medium bowl, sift together 1 cup flour, the salt and baking powder. Set aside. In large bowl, beat butter with electric mixer on medium speed about 1 minute or until creamy. Add half of the 1 cup granulated sugar in 2 stages, beating on medium speed about 2 minutes after each addition until butter and sugar are pale and fluffy. Add 2 eggs and 1 egg yolk, one at a time, beating well and scraping side of bowl after each addition. Beat in vanilla just until combined. Using rubber spatula, fold flour mixture into butter mixture until combined. In medium bowl, toss 1 tablespoon flour with berries. 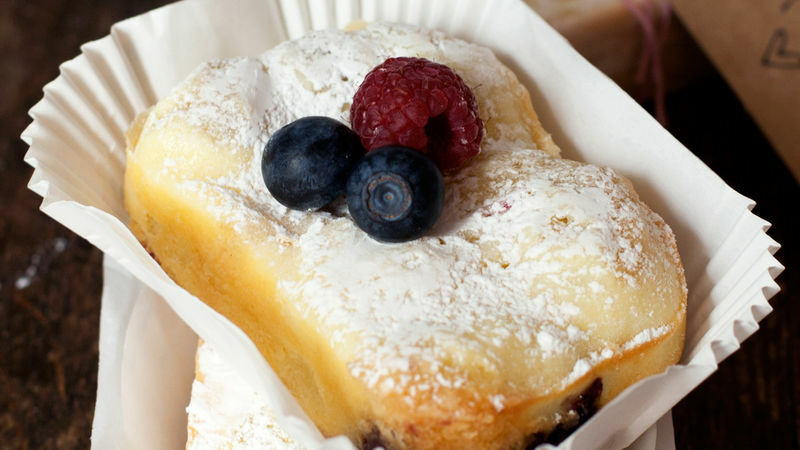 Fold flour-coated berries into batter. Let berries stand while making cream cheese mixture. In clean large bowl, beat cream cheese with electric mixer on medium speed about 1 minute or until smooth and creamy. Add 1/4 cup granulated sugar; beat until well combined. Beat in 1 egg, scraping side of bowl. Beat in 1 tablespoon flour. Divide Pound Cake batter evenly among loaf cups. Divide Cream Cheese Mixture evenly over batter in cups. Using butter knife or off-set spatula, gently make a few strokes through batter for a subtle swirl; smooth tops. Bake in center of oven 25 to 30 minutes or until cakes are golden brown around edges and toothpick inserted in center of cakes comes out clean. Cool cakes in pan on cooling rack 10 minutes. Turn cakes out of pan onto cooling rack. Cool completely, about 30 minutes. Sprinkle with powdered sugar. Cakes can be stored in airtight container in refrigerator for 3 to 4 days. A mini loaf pan that makes 9 perfect loaves is easy to find at any crafts/baking supply store. If you don’t want to invest in a new pan, these cakes can be made in a cupcake pan. They will be a bit smaller, so you will get more. The bake time will also be a few minutes less; start checking for doneness after 20 minutes. The powdered sugar on the tops of these cakes guarantees that they don’t stick to the cellophane bags, ensuring a pretty package. Tossing the berries with a bit of flour allows the berries to be suspended in the batter, so they don’t sink to the bottoms of the cakes. Use any mixture of berries you like, but avoid strawberries as they hold a lot of water and will make for soggy cakes.